This article was sent to me by TulsaKids Magazine and has some great tips on earth friendly things your kids can do to celebrate Earth day! Each year, Earth Day--April 22--marks the anniversary of the birth of the modern environmental movement in 1970. This year's Earth Day theme is "Billion Acts of Green." The purpose of this theme is to mobilize one billion acts of environmental service around the world. The campaign calls for people of all nationalities to commit to an act that helps reduce carbon emissions and promotes sustainability. Whatever the act may be, Earth Day is a great time to generate as many as possible in your community. Collectively, these acts will not only have an impact on global carbon emissions, but will also demonstrate the power of small, everyday, individual acts of green. 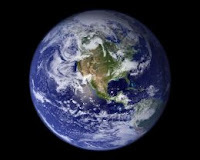 For more information about Earth Day 2011 check out www.earthday.org. Earth Day is a great opportunity to discuss what changes your family can make to reduce the size of your carbon foot print. Let your children know that they can make a difference. Here is a list of 18 Earth-friendly things kids can do to celebrate Earth Day every day. 1. Enlist friends, hand out bags and clean up a nearby park. 2. Plant shrubs or a tree in your yard. 3. Start a vegetable garden in pots or a small plot. 4. Organize a cleanup day at your school. 5. Create posters with environmental themes and ask teachers to post them in their classrooms. 6. Look for recycling symbols on products you or your parents buy. Purchase items in recyclable packaging whenever possible. Avoid products that use excessive packaging. 7. Encourage your parents to carry a reusable shopping bag, and suggest they buy in bulk to minimize packaging waste. 8. Bicycle or walk to school rather than being driven by your parents (as long as Mom and Dad say it's safe). 9. Steer your parents toward organic pesticides, such as those made from orange extract. 10. Turn off lights, fans or the TV when you leave the room (unless your little brother is still in there). 11. Check your home for leaky faucets or toilets, and volunteer to help fix those in need of repair. 12. Don't leave the water running while brushing your teeth or washing your face and hands. 14. Use a broom instead of a hose to clean the driveway or sidewalk. 15. Remind your parents that washing the car less often saves water (and may get you out of the dreaded chore). 16. Ask your parents to raise (in the summer) or lower (in the winter) the thermostat a few degrees, telling them it will save energy as well as money. 17. Lower the blinds when the sun comes up to deflect heat from the windows. 18. Offer to replace air filters. A clean filter helps the air-conditioner run more efficiently. Should I Accept This Offer?